In an exciting development for Miller the community was a grant recipient in The Legacy Foundation's Neighbohood Spotlight program in 2014. A community builder was hired. Check out the links for more information. There has been a proliferation of Facebook pages and groups. Below is a list of what I've been able to gather. Any additions or deletions welcome. Email me. Those that have websites have been listed above. The links below are not duplicates. Of special note is NextDoor.com which provides a more localized and personalized way to relate to neighbors for everything from crime updates to classified ads. 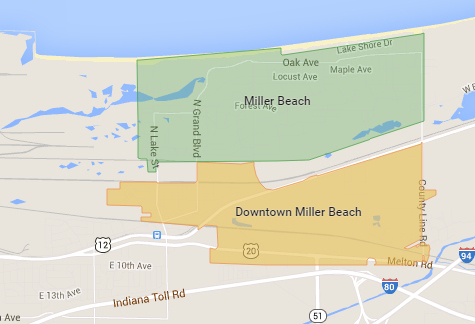 There are two neighborhoods now: "Downtown Miller Beach" and "Miller Beach." You can belong to both neighborhoods when you sign up and use their "nearby neighborhoods" tool. Signing up is easy using your zip code and there's an app for your mobile device. Here's the list of Facebook pages relating to Miller Beach. Some are active, some not. There may be more...let me know.